This is my second year checking out Door Open Toronto, having spent most of my first outing at and around office building on King and Queen. So this year when I scanned the list of options, I was immediately drawn to a dramatically different and more industrial location, the Redpath Sugar refinery. Things started off with a tour of the grounds from the outside, since the actual factory wouldn't be appropriate for a tour group. The buildings were huge, and a lot of fun to shoot with a wide angle lens! Next were also shown a 10 minute movie about the whole process of sugar, from plant to packet. Basically, they ship it from poor countries in huge ships, dump it in this massive warehouse, filter out the crap, heat, filter crap, heat, filter crap and recrystallize. If you want brown sugar, add molasses. Got it? Then they dumped us in a museum for 10 minutes. I wasn't in the mood, so I socialized and played with my camera... and waited for what we'd all really come here for. The sugar! 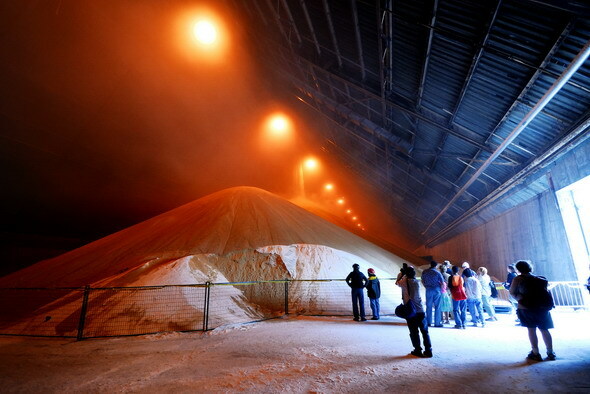 The tour ended in the massive sugar warehouse! It's the size of two football fields! Rule #1: Don't eat the sugar. See multiple references to crap above. Rule #2: Don't bring your dog near the sugar. They use high frequency noise to scare away rodents. And lastly, if you're bringing an expensive camera, make sure your lens has got a filter on it. The air is thick with sugar in the warehouse! Not so sweet for anyone with asthma.